Hi everyone! It is really great to see you all on Day 5 of my virtual book blog tour. I truly appreciate your support! A huge thank you goes to Shaun for hosting me today! I am CJ Bolyne, a first time author. 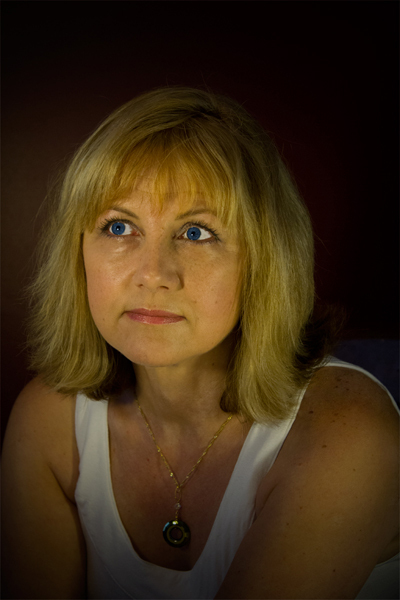 I have wanted to write for a very long time, but like I am sure many other first time authors felt, I was always afraid about what others would think of my writing. Finally, four years ago, I started my first book and thought that, if nothing else, at least I did this for myself! I was born in Winnipeg, Manitoba, Canada. After a few years, my family moved about an hour south of Winnipeg, to a little town called Sarto, Manitoba. Yep, one blink, and you miss it. The remainder of my childhood was spent in the country. Yes I am a country girl at heart. I must admit, I did not read a lot as a child. I read only if I had too and that was usually for school purposes. How I hated the boring books in school! When I was much younger, I felt that my idea of the type of stories I wanted to write were not considered mainstream. When I expressed them to close friends, my ideas were considered too weird. Some said that I had a demented mind. (teehee – what author doesn’t, right?) I laughed about that. I knew that I did not always think the same as many around me. So, okay, my ideas were not considered popular. However, I’m happy to see that in the last decade, the fantasy, SciFi, etc. genres have made a real impact and I am so happy that there are many out there that thought the way I did! This, in part, has inspired me to give it a shot. So many books have influenced me, such as, Cradle and All by James Patterson, City of Bones, part of Cassandra Clare’s The Mortal Instruments series, Dracula by Anne Rice, The Twilight Series by Stephanie Meyer, and of course, the Harry Potter series by JK Rowling. Yes, I am a Harry Potter fan! However, of them all, James Patterson has to be my favourite author. I have always admired his imagination and his ability to write the books he wanted to write. Although, I also admire JK Rowling. In fact, it was after I saw a biography on JK Rowling that I really pushed myself to give writing a real attempt. The book I am reading now is The Magician’s Apprentice by Trudi Canavan. When I write, I write as though I am telling a story aloud, as I hear it in my head. My first serious attempt at writing started four years ago. That is when I started writing Trinity. Due to some personal obligations however, I had to take a break from writing and it was only after I gave my then unfinished book to someone who’s honest opinion, I valued. Her encouragement gave me the courage to finish. Now I can’t wait to write many more as I have so many more stories to tell. What I learned from writing this book is, it is not that easy. You may have the idea, know how you will begin and end the story, but it’s filling in the rest and making it a good and interesting read – now that’s the tough part! CJ Bolyne is a first time author and Trinity is her first book. Born and raised in Southeastern Manitoba, Canada, CJ was an avid reader dreaming of the day she would write her own fantasy / sci-fi book. When she’s not writing, CJ spends her time on her farm with her husband and multiple pets. She runs a full-time pet grooming business. Her first book, Trinity, is the first in the series. Bolyne is also on Facebook. Payton thought she had a normal, everyday life. When a mysterious man suddenly appears, he shatters her world telling her that her entire life has been a lie. She is a god with the Guardians having lived for 1000’s of years. The Anords know where she is and he needs to protect her at all costs. Payton holds the key to saving humanity. However, a mysteriously familiar woman complicates everything. 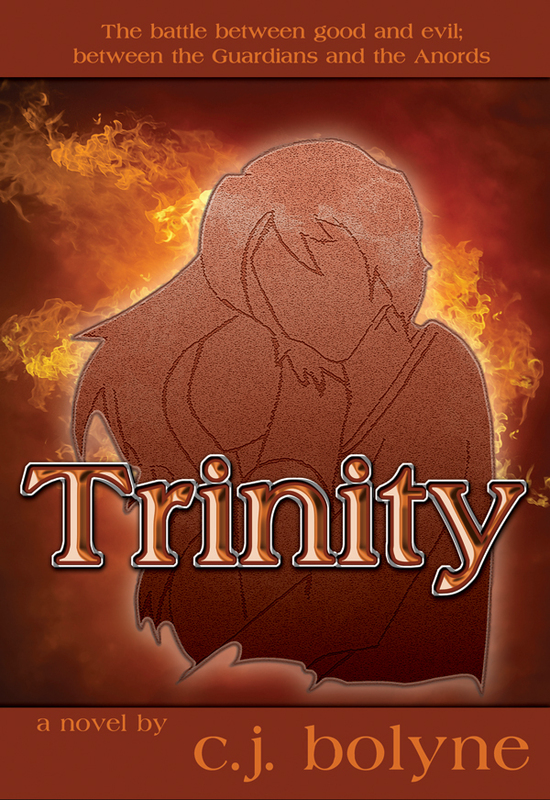 Trinity is available on Smashwords, Lulu, and Amazon. Thanks Shaun for hosting CJ today! She will be by later today to visit and answer any questions and/or comments. 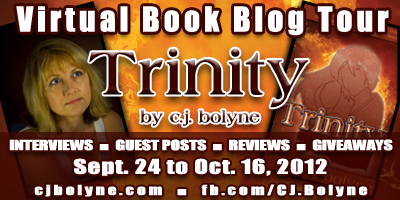 Remember to enter to win one of three signed copies of Trinity click on the Rafflecopter giveaway. Thanks for following CJ on tour!